Color Cream base-card, layered with forest green and cream. Inside Text "From our home to yours, from our hearts to yours . . . Warmest Christmas Greetings!" Inside Description Above the sentiment is a green holly garland with red berries. This 3D card opens horizontally. 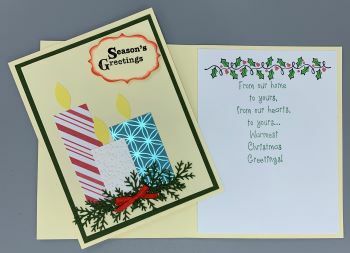 The cream base card is layered with a forest green and then topped with another cream layer. The focal point of this card is the trio of Christmas candles. There is a peppermint striped candle, a white embossed candle and a aqua foil candle. All are lit with a flame. At the candles base is an arrangement of forest green branches. It is adorned with a red ribbon bow. These branches are individually cut out and arranged, so no two cards are exactly alike. In the upper right corner of the card, there is a "majestic" cut out in cream that states: Season's Greetings. It is edged in red and is on an elevated layer.